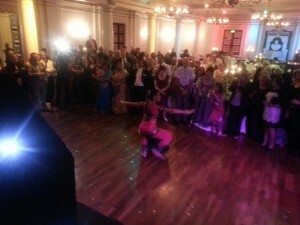 9th September ’12 – Hired as wedding DJ for for Mr & Mrs Kar at Bolton Albert Halls. First time I’ve played at the Albert Halls. What a fab venue for a wedding party! 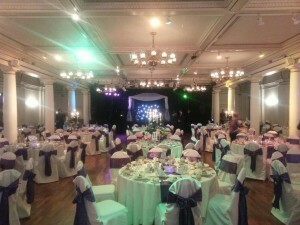 This historic & elegant Victorian building provides a very unique setting for a wedding. We were in the Festival Hall on this occasion. This was a mixed wedding which made it all the more exceptional. Lauren (the bride) is Jewish & Ron Jon (the groom) is Indian. They had booked me from 6.30pm till midnight. They had used the same room during the day for the ceremony & had a gazebo on stage which I then set up in for the evening! 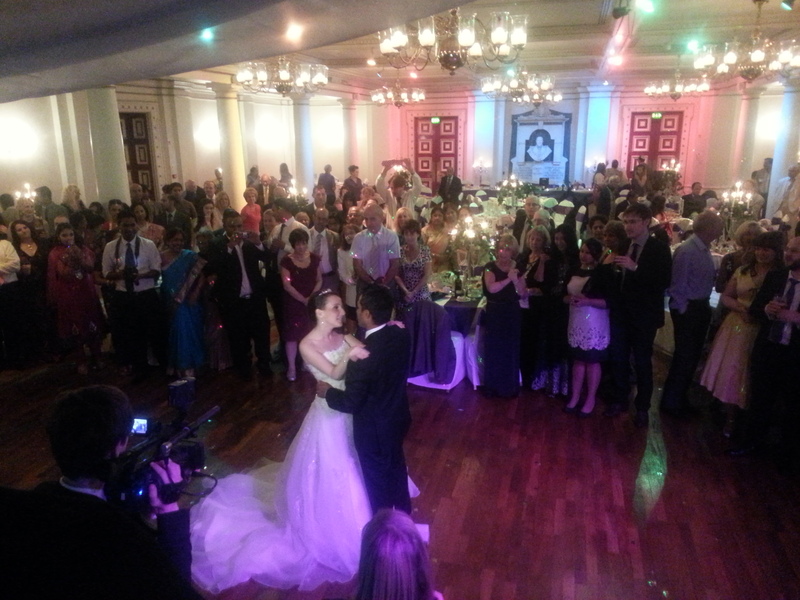 Guests started coming through just after 6.30pm & the bride & groom made their entrance at 7pm. We then had the wedding breakfast & speeches. I played some suitable light background music during food & assisted with the speeches. Lauren actually sang a surprise song which went down a treat! After formalities, I invited the bride & groom to cut the cake, then gathered all the guests around the dance floor for thier first dance. We followed this with 2 Indian dancers who came on individually to perform traditional Indian dance routines. 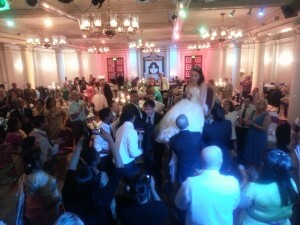 Lauren had found a Bollywood version of the traditional Jewish dance which we played to get started (interesting…!). Then I played the more traditional Hora which guests danced to & lifted Lauren & Ron Jon up in the chairs! I followed this with 10 minutes of Bollywood hits as requested by Ron Jon’s mother, before moving on to your more typical wedding favourites. Lauren had sent me a fairly comprehensive playlist which was mostly mainstream chart & party music, so no worries there, then we had a big finale to New York New York! All the very best to Mr & Mrs Kar! 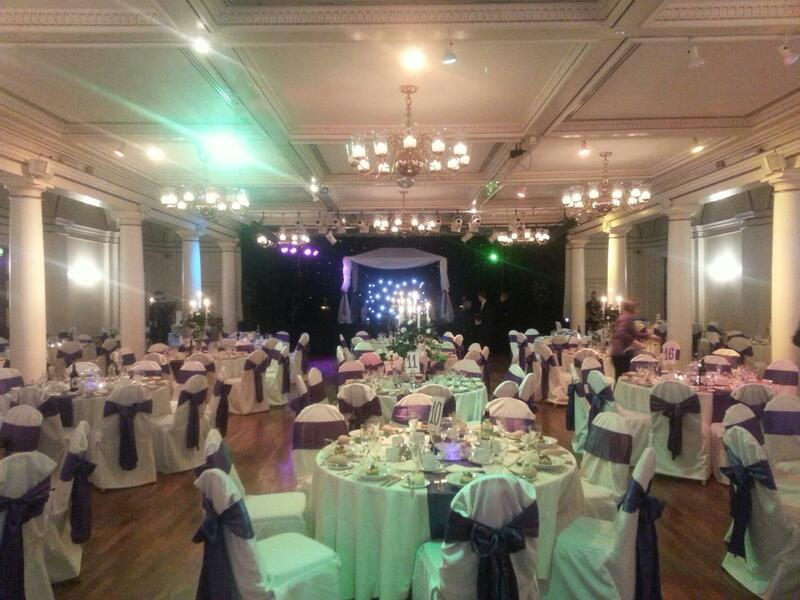 So, if you are celebrating your wedding party at Bolton Albert Halls & need an experienced wedding DJ with a top quality rig to handle a large room, email your enquiry to andy@andybevents.co.uk As a guide, prices start from £295 at Bolton Albert Halls which covers playing times of 7.30pm till midnight. Additional time is £30 per hour.